Kendall was on my to make some recently, and last night I finally did it. Here's the rough recipe for 12 muffins. First I made the topping, softening the butter for 20 sec in the microwave. Mix the flour, brown sugar, and cinnamon together in a bowl, then use a fork to add in the butter. It should be a crumbly topping in chunks, but not too large chunks. This will go on top of the muffins. For the muffins, mix the flour, sugar, baking powder, and salt together in a large bowl. In another bowl, whip the egg, like for scrambled eggs. Then add the milk, oil, and apple butter and mix well. It doesn't look great, but just mix it up. Once that's done, add the liquid to the flour mixture and mix it up well. It should be a fairly smooth batter. Once that's done, add the apple, which gives you a lumpy batter. 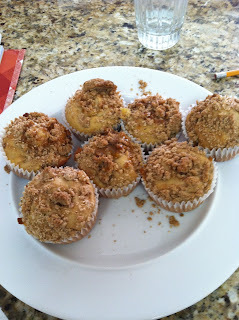 Drop into the muffin cups and then add a spoon of the streusel topping to each. Bake about 22 minutes, though if you're at a lower altitude, perhaps 20 is fine. When the toothpick comes out clean, they're done. I pulled them onto a plate to cool and drizzled some caramel on top. From The New Junior Cookbook. Some great recipes in there the little ones enjoy.